A Confident Victor Olofsson Returns for the Playoffs · Let's Go Amerks! Victor Olofsson returned to Rochester this week after getting a taste of the National Hockey League, the place he’ll likely play for the rest of his career when this season is completed. In six games with the Buffalo Sabres he scored two goals, had two assists, and fit right in with the level of play. The Amerks played six games without Olofsson and finished with a 4-1-1-0 record. Olofsson is still the leading scorer on the Amerks with 60 points (27G+33A) in 64 games played. CJ Smith is hot on his heels with 58 points (28G+30A) in 60 games. At practice this morning he was reunited on in his line with Rasmus Asplund and Danny O’Regan, a line that has played together for the bulk of the season. The talent the three of them show on the ice speaks for itself. I asked Olofsson about being reunited and he said with a smile, “It’s only been two weeks but it feels longer for sure, good seeing them again.” Danny O’Regan missed the last three games with a day to day injury. The three of them were all smiles before practice as they warmed up. Everyone can agree that he can expect a roster spot with the Buffalo Sabres next season. What if he didn’t get the chance to be called up? Would it have hurt his confidence or development? Unlikely. When Olofsson started his North American career in Rochester the question wasn’t if he would adapt to the North American game but how long would it take. The answer was less than two weeks. In the first six games of the season he tallied 12 points (5G+7A). He quickly adapted to the American League game, learned the ropes, and then stepped into the National Hockey League and showed that he belonged. Put AHL where NHL is in the above quote and that could’ve been from the first two weeks of the season in Rochester. 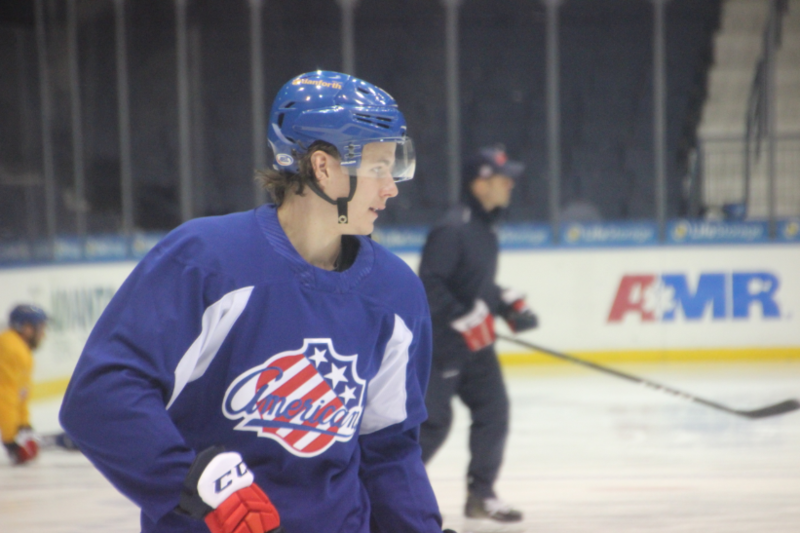 Lawrence Pilut is also back with the Amerks and just like his previous return is just as confident. Remi Elie and Andrew MacWilliam had maintenance days and did not practice. Alex Nylander didn’t skate either. He had missed the last two games in Buffalo after having to get stitches on his leg. With three games left in the regular season the team still has one goal – keep winning and work for that division title. They were in first place for majority of the season and that’s where they want to finish.